MARSHALL DR - TN HUNTING LAND WITH TIMBER FOR SALE, DEER, DUCK, POND, CREEK!!! Here is a Unique Piece of Property in Tennessee that has Many Features. It is a Great Duck Hunting & Deer Hunting Property with a Large Duck Pond on the back of the Property and other Water Sources Running through the property like Springs and Creeks. 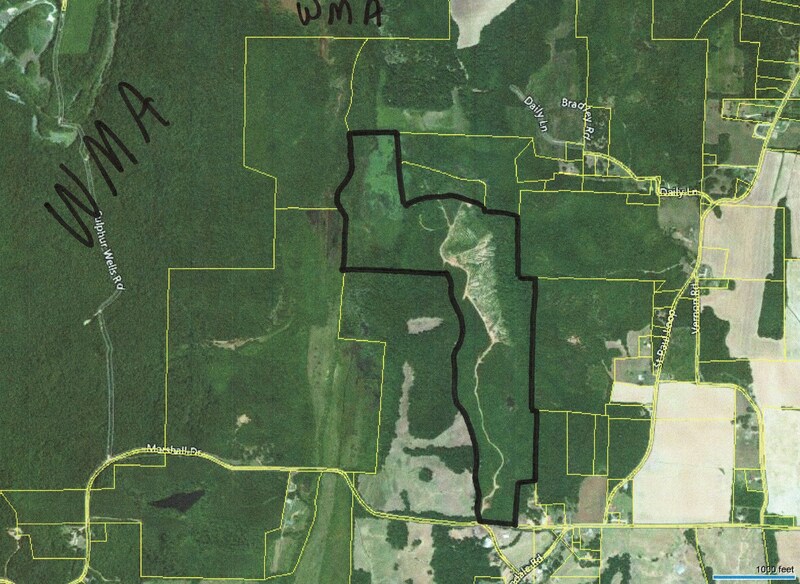 It is located just off of White Oak, a 7,000 Acres Wildlife Management Area (WMA). There is one property line that is approximately 800ft. from the WMA property line. The Duck Pond is approximately 20 Acres+/-. There is about 85 Acres+/- of Mature Timber that is ready to cut with a value of approximately $62,000 at the current market prices as of this listing date. Approximately 68 Acres of this mature timber is in Pine and approximately 18 Acres in Hardwood Timber. The Land has some Nice Building Sites, but one of those sites has Amazing Distant Views that you can see for Miles and Miles. I counted at least 3 Water Towers in View from this Site. I think it would be an Awesome Place for a Cabin. It would be Exceedingly Private. The Road Frontage is Paved and there is a Good interior Road that runs from the Road Frontage all the way back to the Duck Pond. The property is only about 2 miles from the Gorgeous Tennessee River and approximately 12 miles or so from Savannah, TN. You can also buy this property without the timber that is ready to be cut. Last, but not least, the owner will consider Possibly Owner Financing. For more information about this property for sale, please call Tony Alcott at 731-925-7900 or email tonyalcott@unitedcountry.com. Tony Alcott, II grew up in the Morris Chapel Community in Hardin County, Tennessee, graduated from Hardin County High School in 2000 and began his journey as a licensed real estate agent in 2002. He enjoys helping folks with their Real Estate needs and has been able to help a lot of families over the years. His wife and kids are extremely important to him in his life and his two young daughters are the light of his life. He stays very dedicated to his real estate business, but also enjoys a few hobbies when he can like Deer Hunting, Turkey Hunting, Bowling, Coaching Youth Baseball, Volunteering at Church, Teaching Sunday School, and also taught a youth class at church for 12 years. He also recently served a 3 year term on the Board of Directors with the Hardin County Chamber of Commerce. Tony Alcott, II loves selling Small Town Real Estate which is also known as Rural Real Estate. This consists of a lot of different property types which include some of the following, Country Homes, Homes with Acreage, Farms & Ranches, Recreational Properties, Hunting Properties, Log Homes, Cabins, River Front Properties, River Front Homes, Lake Front Homes, Lake Front Properties, Creek Front Homes, Creek Front Properties, Land, Acreage, Farmland, Timberland, Homes in Town, Homes in Neighborhoods, Commercial Properties, Business Properties, and any other kind of property that is located in his Market Area. Tony serves a Large Market area which includes counties in Tennessee, Mississippi, & Alabama. The main area that he focuses on is Hardin County, TN, McNairy County, TN, Wayne County, TN, Chester County, TN, Henderson County, TN, Decatur County, TN, Hardeman County, TN, Alcorn County, MS, Tishomingo County, MS, Tippah County, MS, Lauderdale County, AL, and sometimes Colbert County, AL. He is willing to go outside of this area if the property is an exceptional property. Tony Alcott, II has been the top real estate agent in Tennessee for United Country Real Estate in sales and listings taken since 2004, minus 2007 & 2011 when another agent in his office enjoyed the honor. Tony has also been the #1 Listing Agent for the entire United Country Real Estate family in 2009, 2010, 2011, 2013, 2014, 2015, and was #2 in 2012, #3 in 2016 & 2006, #8 in 2005, #10 in 2004, and #16 in 2008. He has received the Pinnacle Gold Award in 2005, 2006, 2012, 2013, 2014, & 2015 and received the Pinnacle Silver Award in 2004, 2007, 2008, 2009, 2010, & 2016. Simply put, Tony Alcott, II is a Great Real Estate Agent in Tennessee! Contact Tony today for all your Real Estate needs.